California Food Policy Advocates (CFPA) is a statewide policy and advocacy organization dedicated to improving the health and well being of low income Californians by increasing their access to nutritious, affordable food. Through policy advocacy, research, technical assistance, outreach and forging partnerships across the state, CFPA works to strengthen the federal nutrition programs and ensure low-income Californians have access to nutritious and affordable food. Established in 1953, the California School Nutrition Association (CSNA) is a member driven organization dedicated to feeding California’s school children. Our membership includes directors and supervisors, kitchen managers and staff, and our industry partners who support us continually. CSNA provides education and training, professional development and many other opportunities for professional growth to our members. Our mission statement reads: "Educating and empowering members to provide healthy meals to foster an environment where children achieve overall wellness and lifelong success". To help foster this environment, marketing our programs is a key element to our success. We have many customers that we reach every day from the students and their parents to the principal and teachers, your staff and the community at large. We need to let them know what we have done and what we are doing to provide their children healthy, nutritious meals. 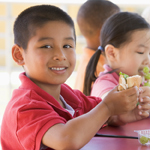 The California Endowment is an active partner in promoting school meals. They support school food service directors to make sure they have the training and equipment they need to provide healthy and appealing school meals. They promote school gardens as a way to teach kids about healthy foods and healthy eating. For more information visit their Web site. The Center for Ecoliteracy is a strong supporter of healthier school meals. They have conducted hands-on trainings for food service staff using their "Cooking with California Kids" cookbook. Their Web site contains tools for demonstrating to decision makers that high-quality, appealing school meals contribute importantly to academic achievement and student health - and can also be good for district finances. For over 90 years, Dairy Council of California has been an innovator in nutrition education and the dairy industry's contribution to community health. Our staff of registered dietitians, nutrition, education and communication experts produce balanced nutrition education programs and resources to assist school nutrition service professionals in enhancing and marketing their nutrition program. Nutrition curriculum and promotional materials are based on the Dietary Guidelines for Americans as reflected by the MyPlate icon, and are designed to help students, parents and staff make balanced food choices. Farm to school is a program that connects schools with local farmers. Students gain access to healthy, local foods as well as educational opportunities such as school gardens, cooking lessons, and farm field trips. Farm to school activities enhance classroom education through hands-on learning related to food, health, agriculture, and nutrition.